UNLIKE many other Asian countries—and in stark contrast to neighbouring Pakistan—India has never been run by its generals. The upper ranks of the powerful civil service of the colonial Raj were largely Hindu, while Muslims were disproportionately represented in the army. On gaining independence the Indian political elite, which had a strong pacifist bent, was determined to keep the generals in their place. In this it has happily succeeded. But there have been costs. One is that India exhibits a striking lack of what might be called a strategic culture. It has fought a number of limited wars—one with China, which it lost, and several with Pakistan, which it mostly won, if not always convincingly—and it faces a range of threats, including jihadist terrorism and a persistent Maoist insurgency. Yet its political class shows little sign of knowing or caring how the country’s military clout should be deployed. That clout is growing fast. For the past five years India has been the world’s largest importer of weapons (see chart). A deal for $12 billion or more to buy 126 Rafale fighters from France is slowly drawing towards completion. India has more active military personnel than any Asian country other than China, and its defence budget has risen to $46.8 billion. Today it is the world’s seventh-largest military spender; IHS Jane’s, a consultancy, reckons that by 2020 it will have overtaken Japan, France and Britain to come in fourth. It has a nuclear stockpile of 80 or more warheads to which it could easily add more, and ballistic missiles that can deliver some of them to any point in Pakistan. It has recently tested a missile with a range of 5,000km (3,100 miles), which would reach most of China. Apart from the always-vocal press and New Delhi’s lively think-tanks, India and its leaders show little interest in military or strategic issues. Strategic defence reviews like those that take place in America, Britain and France, informed by serving officers and civil servants but led by politicians, are unknown in India. The armed forces regard the Ministry of Defence as woefully ignorant on military matters, with few of the skills needed to provide support in areas such as logistics and procurement (they also resent its control over senior promotions). Civil servants pass through the ministry rather than making careers there. The Ministry of External Affairs, which should be crucial to informing the country’s strategic vision, is puny. Singapore, with a population of 5m, has a foreign service about the same size as India’s. China’s is eight times larger. The main threats facing India are clear: an unstable, fading but dangerous Pakistan; a swaggering and intimidating China. One invokes feelings of superiority close to contempt, the other inferiority and envy. In terms of India’s regional status and future prospects as a “great power”, China matters most; but the vexatious relationship with Pakistan still dominates military thinking. A recent attempt to thaw relations between the two countries is having some success. But tension along the “line of control” that separates the two sides in the absence of an agreed border in Kashmir can flare up at any time. To complicate things, China and Pakistan are close, and China is not above encouraging its grateful ally to be a thorn in India’s side. Pakistan also uses jihadist terrorists to conduct a proxy war against India “under its nuclear umbrella”, as exasperated Indians put it. The attack on India’s parliament in 2001 by Jaish-e-Mohammed, a terrorist group with close links to Pakistan’s intelligence service, brought the two countries to the brink of war. The memory of the 2008 commando raid on Mumbai by Lashkar-e-Taiba, another terrorist organisation, is still raw. Pakistan’s nuclear capabilities are a constant concern. Its arsenal of warheads, developed with Chinese assistance, is at least as large as India’s and probably larger. It has missiles of mainly Chinese design that can reach most Indian cities and, unlike India, it does not have a “no first use” policy. Indeed, to offset the growing superiority of India’s conventional forces, it is developing nuclear weapons for the battlefield that may be placed under the control of commanders in the field. Much bigger and richer, India has tended to win its wars with Pakistan. Its plans for doing so again, if it feels provoked, are worrying. For much of the past decade the army has been working on a doctrine known as “Cold Start” that would see rapid armoured thrusts into Pakistan with close air support. The idea is to inflict damage on Pakistan’s forces at a mere 72 hours’ notice, seizing territory quickly enough not to incur a nuclear response. At a tactical level, this assumes a capacity for high-tech combined-arms warfare that India may not possess. At the strategic level it supposes that Pakistan will hesitate before unleashing nukes, and it sits ill with the Indian tradition of strategic restraint. Civilian officials and politicians unconvincingly deny that Cold Start even exists. Bharat Karnad of the Centre for Policy Research, a think-tank, believes Pakistan’s main danger to India is as a failed state, not a military adversary. He sees Cold Start as a “blind alley” which wastes military and financial resources that should be used to deter the “proto-hegemon”, China. Others agree. In 2009 A.K. Antony, the defence minister, told the armed forces that they should consider China rather than Pakistan the main threat to India’s security and deploy themselves accordingly. But not much happened. Mr Karnad sees feeble civilian strategic direction combining with the army’s innate conservatism to stop India doing what it needs to. The “line of actual control” between China and India in Arunachal Pradesh, which the Chinese refer to as South Tibet, is not as tense as the one in Kashmir. Talks between the two countries aimed at resolving the border issue have been going on for ten years and 15 rounds. In official statements both sides stress that the dispute does not preclude partnership in pursuit of other goals. But it is hard to ignore the pace of military investment on the Chinese side of the line. Brigadier Gurmeet Kanwal of the Centre for Land Warfare Studies points to the construction of new railways, 58,000km of all-weather roads, five air bases, supply hubs and communication posts. China would be able to strike with power and speed if it decided to seize the Indian-controlled territory which it claims as its own, says Mr Karnad. He thinks the Indian army, habituated to “passive-reactive” planning when it comes to the Chinese, has deprived itself of the means to mount a counter-offensive. Unable to match Chinese might on land, an alternative could be to respond at sea. Such a riposte was floated in a semi-official strategy document called “Nonalignment 2.0”, promoted last year by some former national security advisers and blessed by the current one, Shivshankar Menon. India’s naval advantage might allow it, for example, to impede oil traffic heading for China through the Malacca Strait. China and India are both rapidly developing their navies from coastal defence forces into instruments that can project power further afield; within this decade, they expect to have three operational carrier groups each. Some Indian strategists believe that, as China extends its reach into the Indian Ocean to safeguard its access to natural resources, the countries’ navies are as likely to clash as their armies. China’s navy is expanding at a clip that India cannot match—by 2020 it is expected to have 73 major warships and 78 submarines, 12 of them nuclear—but India’s sailors are highly competent. 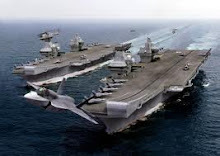 They have been operating an aircraft-carrier since the 1960s, whereas China is only now getting into the game. India fears China’s development of facilities at ports in Pakistan, Sri Lanka, Bangladesh and Myanmar—a so-called “string of pearls” around the ocean that bears India’s name; Mr Antony called the announcement in February that a Chinese company would run the Pakistani port of Gwadar a “matter of concern”. China sees a threat in India’s developing naval relationships with Vietnam, South Korea, Japan and, most of all, America. India now conducts more naval exercises with America than with any other country. India’s navy has experience, geography and some powerful friends on its side. However, it is still the poor relation to India’s other armed services, with only 19% of the defence budget compared with 25% for the air force and 50% for the army. The air force also receives the lion’s share of the capital-equipment budget—double the amount given to the navy. It is buying the Rafales from France and upgrading its older, mainly Russian, fighters with new weapons and radars. A joint venture between Hindustan Aeronautics Limited (HAL) and Russia’s Sukhoi is developing a “fifth generation” strike fighter to rival America’s F-35. As well as indulging its pilots’ need for speed, though, the air force is placing a new emphasis on “enablers”. It is negotiating the purchase of six Airbus A330 military tankers and five new airborne early-warning and control aircraft. It has also addressed weaknesses in heavy lift by buying ten giant Boeing C-17 transports, with the prospect of more to come. Less clear is the priority the air force gives to the army’s requirements for close air support over its more traditional role of air defence, particularly after losing a squabble over who operates combat helicopters. With the army training for a blitzkrieg against Pakistan and the navy preparing to confront Chinese blue-water adventurism, it is easy to get the impression that each service is planning for its own war without much thought to the requirements of the other two. Lip-service is paid to co-operation in planning, doctrine and operations, but this “jointness” is mostly aspirational. India lacks a chief of the defence staff of the kind most countries have. The government, ever-suspicious of the armed forces, appears not to want a single point of military advice. Nor do the service chiefs, jealous of their own autonomy. The absence of a strategic culture and the distrust between civilian-run ministries and the armed forces has undermined military effectiveness in another way—by contributing to a procurement system even more dysfunctional than those of other countries. The defence industrial sector, dominated by the sprawling Defence Research and Development Organisation (DRDO), remains stuck in state control and the country’s protectionist past. According to a recent defence-ministry audit, only 29% of the products developed by the DRDO in the past 17 years have entered service with the armed forces. The organisation is a byword for late-arriving and expensive flops. The cost of developing a heavy tank, the Arjun, exceeded the original estimates by 20 times. But according to Ajai Shukla, a former officer who now writes on defence for the Business Standard, the army wants to stick with its elderly Russian T-72s and newer T-90s, fearing that the Arjun, as well as being overweight, may be unreliable. A programme to build a light combat aircraft to replace the Mirages and MiG-21s of an earlier generation started more than quarter of a century ago. But the Tejas aircraft that resulted has still not entered service. There are signs of slow change. These include interest in allowing partnerships between India’s small but growing private-sector defence firms and foreign companies, which should stimulate technology transfer. But the deal to buy the Rafale has hit difficulties because, though Dassault would prefer to team up with private-sector firms such as Tata and Reliance, the government wants it to work with stodgy HAL. Even if Dassault had a free choice of partners, though, it is not clear that Indian industry could handle the amount of work the contract seeks to set aside for it. Richard Bitzinger, a former RAND Corporation analyst now at the S. Rajaratnam School of International Studies in Singapore, sums up the problem in a recent study for the Zurich-based International Relations and Security Network. If India does not stop coddling its existing state-run military-industrial complex, he says, it will never be capable of supplying its armed forces with the modern equipment they require. Without a concerted reform effort, a good part of the $200 billion India is due to spend on weaponry over the next 15 years looks likely to be wasted. The money it will spend abroad also carries risks. Big foreign deals lend themselves to corruption. Investigations into accusations of bribery can delay delivery of urgently needed kit for years. The latest “scandal” of this sort surrounds a $750m order for helicopters from Italy’s Finmeccanica. The firm denies any wrongdoing, but the deal has been put on hold. Britain, France, Israel and, above all, Russia (which still accounts for more than half of India’s military imports), look poised to be beneficiaries of the coming binge. America will get big contracts, too. But despite a ground-breaking civil nuclear deal in 2005 and the subsequent warming of relations, America is still regarded as a less politically reliable partner in Delhi. The distrust stems partly from previous arms embargoes, partly from America’s former closeness to Pakistan, partly from India’s concerns about being the junior partner in a relationship with the world’s pre-eminent superpower. The dilemma over how close to get to America is particularly acute when it comes to China. America and India appear to share similar objectives. Neither wants the Indian Ocean to become a Chinese “lake”. But India does not want to provoke China into thinking that it is ganging up with America. And it worries that the complex relationship between America and China, while often scratchy, is of such vital importance that, in a crisis, America would dump India rather than face down China. An Indian navy ordered to close down China’s oil supplies would not be able to do so if its American friends were set against it. India’s search for the status appropriate to its ever-increasing economic muscle remains faltering and uncertain. Its problems with Pakistan are not of the sort that can be solved militarily. Mr Karnad argues that India, from a position of strength, should build better relations with Pakistan through some unilateral gestures, for example cutting back the size of the armoured forces massed in the deserts of Rajasthan and withdrawing its short-range missiles. General Ashfaq Parvez Kayani, head of Pakistan’s army, has declared internal terrorism to be a greater danger to his country than India. That may also offer an opportunity. China’s confidence in its new military power is unnerving to India. But if a condescending China in its pomp is galling, one in economic trouble or political turmoil and pandering to xenophobic popular opinion would be worse. Japan and South Korea have the reassurance of formal alliances with America. India does not. It is building new relationships with its neighbours to the east through military co-operation and trade deals. But it is reluctant to form or join more robust institutional security frameworks. Instead of clear strategic thinking, India shuffles along, impeded by its caution and bureaucratic inertia. The symbol of these failings is India’s reluctance to reform a defence-industrial base that wastes huge amounts of money, supplies the armed forces with substandard kit and leaves the country dependent on foreigners for military modernisation. Since independence India has got away with having a weak strategic culture. Its undersized military ambitions have kept it out of most scrapes and allowed it to concentrate on other things instead. But as China bulks up, India’s strategic shortcomings are becoming a liability. And they are an obstacle to India’s dreams of becoming a true 21st-century power.